This week we will transition from the “practical benefits” to two “historical arguments” for weekly observance. It is our plan to conclude this series of articles in a few weeks by addressing frequently asked questions about weekly observance. But, before that, let’s consider two arguments from history. 1. The ordinances are central, formative practices of the local church. Christians have long discussed the marks of a “true church.” When does a group become a church? What distinguishes a Christian church from other religious gatherings? What is the irreducible, ecclesiological minimum? Although these may sound like “boring theological debates” our answers have a widespread effect. It is easy to see the repetition within this historic church writings. These two marks, the right preaching of the gospel and the observance of the ordinances (sacraments) are central to what makes a church – a true church. Both the creation and the preservation of a local church are built upon these marks. The gospel heard and received creates and forms the people of God. The right administration of baptism and the Lord’s Supper distinguishes, guards, and preserves the church. But, what does this have to do with the frequency of communion? Well, nothing … directly. However, by implication, it could be easily argued that the formative marks of the church should be given a more prominent place within the weekly gatherings of the church. As was said this past weekend, the church does not have the ability to plan and program a regular rhythm of baptism. Baptism is a blessed act of obedience that comes as a fruit of the Lord’s redemptive work in an individual’s heart. So, we pray for God to save. We offer classes to answer questions and promote baptism as a matter of Christian obedience. And, when one comes forth for baptism, we will make a big deal of it! That said, we still cannot plan or control its regularity. Conversely, it is completely within our power to plan the preaching of the gospel and the celebration of the Lord’s Supper. So, we believe that by submitting to the preached Word and observing the Lord’s Supper weekly we do our part to continue in the stream of blessing the Lord has set out for His local churches. 2.A glimpse of frequency in church history. Although history is not authoritative, these two points, in combination with those arguments from Scripture make a fairly strong case for the benefit of observing communion with great regularity and consistency. Add in the practical benefits that have been outlined and we believe we stand on solid ground as we pursue a weekly observance of the Lord’s Supper. 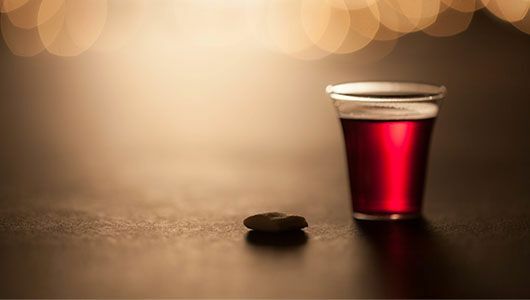 So, as you prepare your hearts for our Sunday gathering, take time to consider these two points (a) the Lord’s Supper is not a second-tier element within the gatherings of the local church. It is an essential part of what it even means to be a church. Also, (b) consider the reality that brothers and sisters, for thousands of years of church history, have done this same symbolic act. So, prepare your hearts to take, feast, and celebrate the Lord’s finished and future work.